We will need to set up a sample "userdemo" database. The database will have a single table named user for storing data associated with users of our website (see figure 16.2 below). the id is an auto-incremented integer field (primary key). the email is a string field containing user's E-mail address. Each user will have a unique E-mail address, so this field is a unique key, too. the full_name string field will contain the full name of a user (like "John Doe"). the status integer field will contain user's status (either "active" or "retired"). Retired users are not allowed to log in. the date_created contains date and time when the user was created. 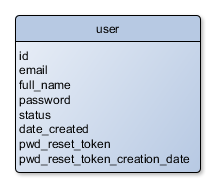 the pwd_reset_token and pwd_reset_token_creation_date fields are used for password resetting (when the user forgets his/her password and needs to reset it). In your own website, you will likely want to add more fields to the user table. In this sample, we only define some minimum set of fields. You can find a migration, which creates the user table, in the User Demo sample application. If you are new to migrations, refer to chapter Database Migrations.